The Barbarian is probably the most powerful card in the base game. It kills any monster anywhere on the board (including the castle ring). Avoid using it for monsters with one or two hit points unless they are about to topple your last tower. By playing the barbarian card on monsters with three hit points, it is like getting two free hits. Several times a game you will be faced with multiple monsters in the same color arc pressing on the castle and not enough resources to handle them all. If you have a 2-HP monster and a 1-HP monster in the blue swordsman ring with 1 blue swordsman in your hand and walls in front of both of them it’s tempting to knock out the 1-HP monster to claim the trophy… but if you instead hit the 2-HP monster the walls will kill both of them. You don’t get the trophy, but neither do your teammates, and you’ve helped your chances of overall team success. Further, when hit cards are scarce but several people have brick or mortar and several monsters are hitting the swordsman ring, your tactic should be to get as many matching sets of brick and mortar to the players that can keep them out of the castle so that they can throw them up just in time to damage the monsters. You’ll feel a little naked using all of your walls as ammo and leaving castle pieces exposed, but you’ll get your monster problem under control quickly. If you’re playing the fully cooperative version of the game (ie, nobody keeps their monster tokens and nobody is declared “Master Slayer”) these should be common tactics. But when you’re keeping tokens and aiming to claim the Master Slayer title it may be a little tricky. I find a little altruism goes a long way – you can use your personal sacrifice as leverage to get your teammates to do the same later in the game. When playing Castle Panic I usually play co-op with my family insted of the competitive version. We find that I end up telling people how to move and how to plan our strategy. To prevent this we at times will house rule no table talk other than trades of cards. That allows the kids to make decisions for themselves without input from others all the time. It actually throws a bit more randomness into the game and can make it more enjoyable for adults as well. For more of a challenge with just the base set (and a bit more unpredictability), put the non-monster tiles back in the bag after they have been drawn. You can still keep track of how many monsters you have left to go by counting the killed monsters, but multiple plagues, the threat of a boulder, or the surprise of having all the monsters rotate will always be present and keep you on you toes. My daughter is now 4 1/2, and I have found that this is a game that is perfectly playable for her. There isn’t even a great deal of rule changing necessary. The big thing is to sit down with your child and explain the game mechanics. I start with the colors, and point out that there are three different colors. Next, I pull out an Archer, Knight and Swordsman, and a couple of monster tokens. My daughter is just starting to learn to read, so these words are too big for her to sound out just yet, but she does recognize all her letters. I tell her to spell each of the words, and then to match the cards to the rings on the board. I then explain to her that those cards only work on monsters on that ring by placing monsters on rings and demonstrating. Then I point out the colors on the cards, and explain how a monster has to be in that color as well as that ring. I next explain the Hero card. At this point I give a little quiz. Should she pass the who can attack what quiz, I move on to monsters. I first have her spell the names on the monsters and tell her how to pronounce them, then explain that each number on the monsters indicate how many times they have to be hit to defeat them. I found this to be a great opportunity to teach some simple addition and subtraction, mostly through the use of her hand. How many cards do you have? How many should you have after you draw? How many do you need to draw to get to six? That sort of thing. I found she learned a bit watching how I dealt with the monsters and began to understand that letting a monster get close to the wall was a bad thing. I have no doubt that repeated playthroughs will cause her to recognize many of the special cards and tokens and how to utilize them with less of my intervention. The biggest thing to keep in mind is that winning is beside the point here. Spending time with your child/children is the order of the game, and in a couple of playthroughs, I have found this game does a great job of finding a balance, allowing her to actually play much of the game rather than me playing it for her. OK, I know a lot of you probably don’t need to be told this but I did so I’m trying to help others like me. A small change but boy is it a pleasant/fun one is instead of laying out all of the monster tiles out on the table, just put them in a dice bag and draw them out instead. I may be dense, but I didn’t think of doing this until I heard a monster bag was provided in the Castle Panic expansion. I don’t have the expansion yet, but I did have a dice bag available and using it makes more of a difference than I would have imagined. 1) Tougher Monsters. Mega Bosses with more HP and abilities, flying monsters, fire breathing, etc. 2) Wizard Tower – Replaces one original tower on the board. Last but not least, you even get a fairly decent monster token bag, with eyes on the side. Much better than using a box lid! All of these additions make for a tougher, more varied game. Walls can be set on fire (as can enemies), cards can combo better, etc. This is a prime example of the perfect expansion, improving the game in just about every way, while not completely re-inventing the wheel. Our family plays this game often enough that it has become somewhat simple. We were reading the instructions for variants and saw the assign each player a tower version. Why not? It is really fun and takes cooperative to a higher level. Basically, you assign a number tower to each of you and if that tower gets taken out so does the player. Instead of using the walls and a few towers to take out players we found we were using tar, barbarian, push back cards much more strategically to keep us from getting knocked out of the game. One note: if our young daughter was eliminated early in the game somehow we would usually start over as she doesn’t want to sit and watch us finish the game (the elimination factor isn’t much fun when you’re the one who is out). But it does up the ante and we play this way from time to time. I reccomend this as a first game to teach your kids. The co-op factor allows you to monitor and assist young ones in rules, concepts and game stratigies. I introduced this to my 5 year old and she was able to figure it out and has expanded her ability to play harder games. While this game is simple, I still find it very enjoyable to play. Game too easy for you? Feeling cocky teasing the Orc Warlord from the security of your fortitfications? Start the game with no walls. Your wins will become significantly more sparse, but will feel much more rewarding. It’s important to remember that you have the option to discard one card to draw another card a single time per turn. This is done before you trade and play and can save you from a hand that has too many of the wrong color. Cooperative games like Castle Panic are excellent to bring kids in to gaming. The Co-op nature allows you to support, encourage and play alongside kids in a way that competitive games can’t do. As a bonus, it’s building teamwork. Castle Panic is even better in the regard as it’s easy to remove some of the boss tokens and play a streamlined version. Sure, the gameplay isn’t quite as fun, but it creates a fantastic intro for little gamers. We play with a house rule that allows you to actually knock the monster back instead of hitting it for one point of damage. The advantage being that your partner may have the cards to kill the monster on their next go (even after swapping one card). This is also advantageous for any monsters in the ‘swordsman’ ring, buying you more time ! Due to the standard mode of this game being a “Competitive Co-op,” it really makes no sense to have your hand face up for all to see. All this does is cause other players to request cards from you, and can cause bad feelings if you accept or deny the request. I’m not sure what the designer was thinking here. Players can still request a card, but saying “no” is easier if they cannot see what you have, and provides a tactical advantage. You can always offer cards as well. NOTE: This is also an important component in our traitor variant, as the traitor is not present in every game. House Rule: Hide your hand! NOTE: if you are playing with your kids and want to help… that’s fine (of course). I do this all the time with games where you are supposed to hide your hand. This is actually a style of play which the good folks at Fireside have developed to use when on tour at various game stores or conventions around the country. 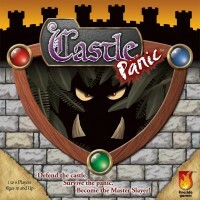 It requires two complete sets of Castle Panic, and can be played with the Wizard’s Tower expansion as well; although both sets must be identical before play starts. OK, mostly identical; I recommend if using the Wizard’s Tower expansion that only one set of the Mega-Boss Monsters be used with three going into each of the two draw bags (that’ll make more sense in a minute). Each team of players will be working not only to defend their own towers from attacking monsters, but will be working to destroy the towers of the other team’s castle. “How,” you ask. Like this: once you kill a monster token, instead of placing it to one side—never to be dealt with again—you place it into the opposing team’s draw bag. The pace of play on the two teams need not match, so The faster you kill monsters, the faster they go into the other team’s bag and the more the will have to deal with. But it is best played with the same number of players on each team. Play proceeds until one team loses all six of it’s towers. I’m still wrapping my head around how this style of play would work in conjunction with the Dark Titan expansion, but once I get it right in my head, I’ll post it under the expansion. Sometimes this game can just punish you! If you feel like making the game a little easier, make a house rule that the Hero can hit monsters inside the castle, so long as they are in the same color zone as the Hero’s color. That gives you a another option besides waiting for those special cards that can only affect monsters inside the castle walls.